Submitted by Pierre Lebeaupin on August 8, 2016 - 1:03am. 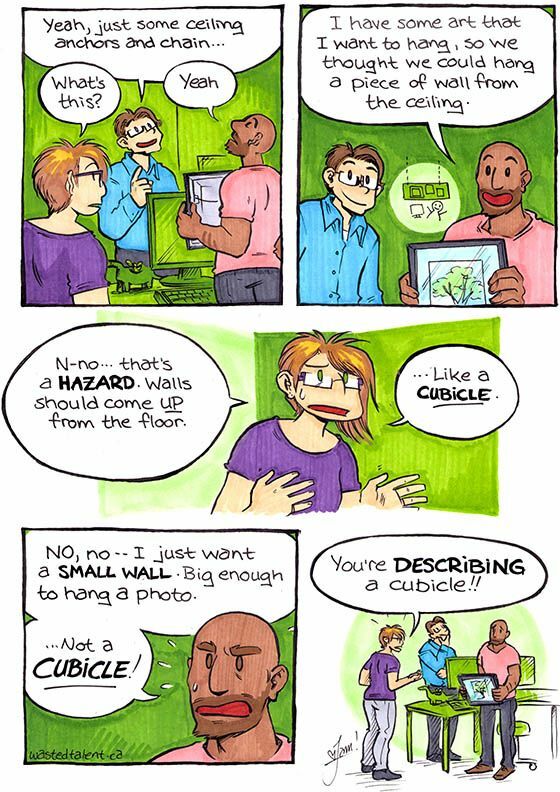 …which is why I have the cover art for "Cubicle Warrior" held by magnets on the back (facing me) of one of the closets that delimit subunits in the weird open plan/cubicle hybrid that is our office. I demand freedom from walls! Submitted by Fluffoth the Mehgty on August 8, 2016 - 5:23am. Why doesn't he just hang the picture itself from the ceiling? Use bars instead of rope and you won't have to be concerned about a free swinging pane of glass. I'm sure you could figure it out better then I could because, you know, engineers. Submitted by KrystaVixen on August 8, 2016 - 7:35pm. Submitted by bbullock on August 10, 2016 - 12:34pm. I recall reading that the whole point of the cubicle system was to allow open communication, ease of working together, useful interaction, etc... and that studies showed, in fact, that a cubicle system did the opposite of everything it was intended to do. Now, I don't know how accurate any of this is, so don't quote me, but I know I've always hated cubicles. Submitted by thisfox on August 11, 2016 - 1:27am. How large is this open-plan room, anyhow? Presumably somewhere the room has walls. I doubt the room is simply a roof and a floor. Even if they are entirely made of see-through glass (I hesitate to use a toilet in such a building), you could probably put a hook on those glass walls. Or failing that, why not hang the artwork itself, wall-less, from the ceiling? Or failing even that, what is wrong with putting the artwork on a patch of desk, on a stand, like a guitar stand? Submitted by Elyandarin on August 13, 2016 - 8:09pm. Anchor the top corners to the ceiling and the bottom ones to the floor. Ought to work for a piece of wall or for the paintings themselves. Sure, sure, it starts innocently enough, but those who don't remember cubicles are doomed to rebuild them.